Spinsolve at the Rochester Institute of Technology in the Laboratory of Professor Joseph Hornak. Dr Joseph Hornak is Professor of Chemistry and Imaging Science at the Rochester Institute of Technology, RIT, where he teaches courses in magnetic resonance imaging, nuclear magnetic resonance spectroscopy, analytical chemistry, and physical chemistry. He is also Director of the Magnetic Resonance Laboratory, MRL, a research and development laboratory on the RIT campus. His research interests include multi-spectral tissue classification with magnetic resonance images, near-surface MRI, low-frequency electron spin resonance of free radicals, magnetic resonance hardware development, and magnetic resonance imaging of materials. Dr Hornak is author of more than 170 published and conference papers on magnetic resonance related topics. MRL is a research and development laboratory devoted to solving real world problems using magnetic resonance. Its focus varies greatly. Currently the lab is working on a phantom for fMRI, developing applications for low frequency electron paramagnetic resonance, and measuring relaxivities of some targeted MRI contrast agents. 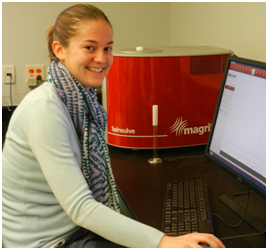 Dr Hornak’s student, Amy Becker, a 2nd year Imaging Science student at RIT, is working on the analysis end of the project involving the contrast agents. The project is a collaboration with a research group headed by Dr Hans Schmitthenner which is synthesizing some unique, targeted MRI contrast agents. Amy’s project is to measure the NMR relaxivity of the agents. As with all contrast agents, you want to know the relaxivity at the field strength they will be used. Most clinical MRI systems in the world operate at a field strength of between ~0.75 and 3.0 Tesla. MRL chose the Magritek Spinsolve system because it operates at ~1 Tesla and is therefore a perfect instrument for getting these values at the low end of this range.